Here’s another little gem (pp. 65-66) from Ralph Hawtrey’s Trade Depression and the Way Out. He discusses the amazing revival of business in the depth of the Great Depression triggered by FDR’s suspension of the gold standard in March 1933 immediately after taking office. Despite the suspension of the gold standard, there was period of uncertainty lasting over a month because it was not clear whether FDR would trigger a devaluation and the Treasury Department was issuing licenses to export gold preventing the dollar from depreciating in the foreign exchange markets. It was not until April 19 that the Secretary of the Treasury declined to issue any more licenses. A license was a device for sustaining the value of the dollar. It was an instrument of torture designed to inflict further distress on a suffering nation. The pen refused to write the signature. No licenses were to be granted. At once the dollar fell. The discount soon exceeded 10%. The suspension of the gold standard had become a reality. The impulse given towards the revival of industry was instantaneous. It was like the magic change of spirit that seized the Allied line at Waterloo late in the afternoon, when there passed through the French ranks the terrible murmur “the Guard is giving way,” and the cohesion of their onset was at last loosened. . . . The eagles (258 grains, nine-tenths fine) were in full retreat. Manufacturers pressed forward to fulfill a stream of orders such as they had not known for years. Wheat and corn, cotton, silk and wool, non-ferrous metals, rubber, almost every primary product found increased sales at higher prices. The steel industry, which at one time in March had been working at 15% of capacity rose in three months to 59%. The consumption of rubber in June exceeded the highest monthly totals of 1929. The index of manufacturing production, which relapsed from 66 in September 1932 to 57 in March 1933, advanced to 99 in July 1933, the highest since May 1930. The index of factory employment rose from 56.6 in March to 70.1 in July, and that of factory payrolls from 36.9 to 49.9. The Department of Labour Price Index rose from 59.8 in February 1933 to 69.7 on the 22nd July, the Farm Products group rising in the same period from 40.9 to 62.7. This revival was a close parallel to that which occurred in Great Britain after the suspension of the gold standard in September 1931. On that occasion bank rate was put up to 6%, and renewed deflation and depression followed. In the United States, on the other hand, not only was cheap money continued (the 3% rediscount rate in New York being completely ineffective), but wide and unprecedented powers were conferred on the President with a view to a policy of inflation being carried out. . . .
For a month the depreciation of the dollar had no other source than in the minds of the market. The Administration quite clearly and certainly intended the dollar to fall, and every one dealing in the market was bound to take account of that intention. Towards the end of May the Federal Reserve Banks began to buy securities. By the end of June they had increased their holding of Government securities from $1,837,000,000 to $1,998,000,000, and the dollar was at a discount of more than 20%. The New York rediscount rate was reduced from 3% to 2.5% on the 26th May, and even the lower rate remained completely ineffective. In July, however, the open market purchases slackened off. And other circumstances contributed to check the progress of depreciation. . . . Above all, on the 20th July, a plan for applying the minimum wages and maximum hours of the National Industrial Recovery Act throughout the whole range of American industry and trade without delay was put forward by the Administration. Profits were threatened. The discount on the dollar had reached 30% on the 10th July, but, from the 20th July, it met with a rapid and serious reaction. There were fluctuations, but the discount did not again touch 30% till the middle of September. And the recovery of business was likewise interrupted. There was some tendency to regard the policy of minimum wages and maximum hours as an alternative to monetary depreciation as a remedy for the depression. It’s instructive to compare Hawtrey’s account of the effects of the devaluation of April 1933 with the treatment by Friedman and Schwartz in their Monetary History of the US (pp. 462-69) which treats the devaluation as a minor event. A subsequent discussion pp. 493-98 fails to draw attention to the remarkable recovery triggered over night by the devaluation of the dollar, and inexplicably singles out a second-order effect – increased production in anticipation of cost increases imposed by the anticipated enactment of the National Industrial Recovery Act – while ignoring the direct effect of enhanced profitability resulting from the depreciation of the dollar. The revival was initially erratic and uneven. Reopening of the banks was followed by a rapid spurt in personal income and industrial production (see Chart 37). The spurt was intensified by production in anticipation of the codes to be established under the National Industrial Recovery Act (passed June 16, 1933), which were expected to raise wage rates and prices, and did. A relapse in the second half of 1933 was followed by another spurt in early 1934 and then a further relapse. A sustained and reasonably continuous rise in income and production did not get under way until late 1934. This is an example of how Friedman’s obsession with the quantity theory, meaning that the quantity of money was always the relevant policy variable blinded him from recognizing that devaluation of the dollar in and of itself could raise the price level and provide the stimulus to profits and economic activity necessary to lift the economy from the depths of a depression. The name Hawtrey appears only once in the Monetary History in a footnote on p. 99 citing Hawtrey’s A Century of Bank Rate in connection with the use of Bank rate by the Bank of England to manage its reserve position. Cassel is not cited once. To my knowledge, Friedman did not cite Hawtrey in any of his works on the Great Depression. Of course, printing more money and getting the economy going again, and devaluing the dollar, are great options. Inflation is deader than Spiro Agnew. Unit labor costs are lower than in 2009, and commercial real estate is half price. Right there, labor and rents, are about 70 percent of business costs. inflation is dead. Ben Bernanke ought to put the printing press lever on high, and lock the doors. Print money until the plates melt. Right now I think any amount of QE would be only beneficial, up to several trillions of dollars. That is what Milton Friedman advised Japan to do. Should we also endure 20 years of deflationary perma-recession? I prefer prosperity. Call me irresponsible. The Theo-Monetarists and Econo-Shamans, with their genuflection to sacred gold and prayers to “sound” currency, are active menaces to US prosperity. I found your quote about Friedman’s obsession with the money base/money supply intriguing. Can we draw parallels to it today? Could we argue that the Fed, the BoE, the BoJ etc are obsessed with inflation targeting? I think we certainly could up to the very depths of the crisis, otherwise surely there was justification for far greater stimulus. Its even evident now with inflation, although above target, falling rapidly after the temporary commodity shocks from last year. This post is certainly one more “scratch” in the MM “scoreboard”. Ah! The dangers of policy guided by “obsessions”. In Friedman´s case it only “penalized” his analysis. In other cases, consequences were much more serious! Hmmm. Important post. I hadn’t realised that F&S had missed the importance of this event. Monetarism does move on! what does Hawtrey mean by “ineffective” here? Very interesting post, Mr. Nunes. Another little tidbit to at to Hawtrey’s list. The Dow rose 14% in the two days after the announcement of a cease in licenses issued for gold export. The bottom of the Dow was set back in 1932, though. Hawtrey highlights the effect of the devaluation on, “Wheat and corn, cotton, silk and wool, non-ferrous metals, rubber…” He left out oil, but I imagine it went up nicely as well. One could argue we have already seen the 1933 devaluation (against a commodity basket) in the past three years. We just have a services-dominated economy and a housing market that has not yet cleared. Hence, the response has been altogether different. As I understand it, the concept of the “velocity of money” is the Achilles heel for Friedman and the quantity theory. Bernanke appears to be focused on avoiding deflation, full stop. QE2 can be seen as a response to rising deflation expectations in the spring of 2010 and it seems to have worked. Deflation is bad but so is slow growth with a large output gap. Benjamin, Printing money is a good idea when the economy is wallowing in a depression as we still are. Jason, I have argued that inflation targeting is a bad idea, because the optimal rate of inflation depends on the real interest rate. When real interest rates change, the optimal rate of inflation changes. When the real rate of interest is too close to the expected rate of inflation, the economy can take a nosedive, as it did in 2008. Nick, Thanks. What Hawtrey means is that there other sources of funds available at less than the rediscount rate. The Fed was not the marginal supplier of funds. JP, Thanks for the tidbit. David, There have been ups and downs in the commodities. And unfortunately there have been other factors than monetary policy affecting the price of oil and some other commodities. Peter, Bernanke did not allow the bottom to fall out from beneath our feet. But more could and shoul.d have been done to promote a recovery. BRIC growth has, if anything, surprised to the downside since 2010. The “unanticipated real demand shock” explanation for the commodity rally is wearing thin. Given China’s negative real deposit rates and India’s persistently high inflation, it is likely that BRIC monetary policy is now one of the main causes of rising commodities prices. This monetary policy is, in turn, a function of dollar peg regimes and U.S. real rates. Commodity prices were the key transmission mechanism for the 1933 devaluation. A similar move today would only exacerbate whatever real factors are pushing commodities prices north. The effect of rising commodity prices on the broader economy would be quite different today than in 1933. Its not clear that the net effect would be positive. That is my main point. David Glasner – in what respect are we in a depression? Last quarter was 3.7% yoy nominal GDP; the manufacturing NAPM ISM index (a good predictor of future GDP) was 54.1 in Jan (above 50 indicates expansion). Continuing Claims 3392 (at the same level as 2003); world equity indices have retraced most of the drop associated with the recession, with the Nasdaq at new highs. The unemployment rate – whilst high at 8.3% – is down significantly from its peak of 10%, and this peak itself was lower than the 1982 high of 10.8%, and not all that much higher than the 1975 peak. What data should I be looking at to make it clear to me that we are in a depression, bearing in mind that in the past at recession troughs people have often declared us to be in a depression, only to see us subsequently recover rather well. Printing money won’t help unless it gets used to hire someone. Borrowing requires cash flow, so just offering it for loans has a bootstrap problem. The Fed can print all the money it wants, but it can’t hire 500,000 light bulb changers at $10 an hour, 35 hours a week guaranteed shift. Is this suppose to be a lesson in international monetary economics .. or a lesson in closed economy macroeconomics? Here is a chart showing the 12-mo. 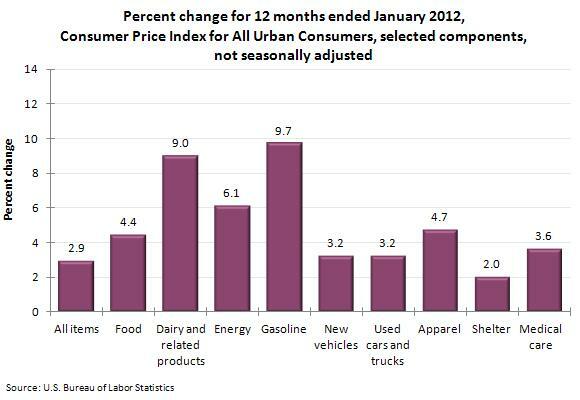 change in a broad range of CPI components. IMO, FDR would have been quite happy with this performance following 1933. The question is, if the Fed eased to produce 4-5% inflation, as MM’s recommend, what would each of these components look like, and how would that affect l.t. household real wage growth expectations? In turn, what impact would that have on current real household spending? David, Very good set of posts on Hawtrey. This is also my view of 1933. In my manuscript on the Depression, I devote 3 chapters to just 1933. There were 10 news announcements in the April – July period that drove the dollar lower. So the depreciation was planned and managed by FDR. Nick Rowe, I think they mean that market interest rates were far below the discount rate in 1933–close to zero. David, I was referring to disturbances to the world oil market. Last year it was the revolution in Libya that shut down Libyan production. This year it is the situation in Iran. I don’t think monetary policy had any effect on either episode. Kaleberg, Printing money should improve expectations and encourage investment. Increased investment will increase employment. Greg, I don’t understand your question. The two are not mutually exclusive; it could be a lesson in either. David, Well, the wholesale price index rose by almost 15% from April to July 1933, so I am not sure that we have done as well as FDR did in 1933. And if there was a pickup in GDP growth and employment in the second half of 2011, perhaps it had something to do with a pickup in the rate of inflation in 2011. Again, when we talk about real wage growth expectations there are two components. One is the real wages of those already employed which may go down slightly; the other is the real wages of those who will become employed which will go up a lot. Scott, Thanks. I took for granted that everybody knows that it was you who rediscovered the remarkable forgotten recovery of April to July 1933. But I should have credited you. It was from you, not Hawtrey, that I learned about it. It is the the real wage GROWTH expectations of the employed that matter. What you see as a modest current decline in real wages might be seen by them as a reduction in the real wage growth trend. This would cause them to defer consumption and increase saving. There is simply no way of knowing if a Fed-engineered real wage decline will affect real wage growth expectations. IMO, this dynamic is sensitive to initial conditions: in 1933, real wages had spiked to unsustainable levels; the ensuing modest decline was likely seen by households as an inevitable correction. In 2008, real wages for middle-income households had been stagnant for many years, and the GFC likely sent the message that this stagnation was a sustained trend. Further depressing real wages with that starting point may have a different effect on current spending. I’m pushing you David to make a clearer and cleaner claim about what sort of monetary disequilibrium you are asserting existed in the 1929-1933 period, is this a domestic disequilibrium or an international disequilibrium — or are these temprary effects any nation could achieve via competitive devaluations of the currency, i.e. improving the terms of international trade via unsustainable temporary monetary policy. Or are a ping pong of competitive devaluations among nations a pure free lunch? David, You could be right, but I think that increasing the rate of NGDP growth and increasing prices both tend to expand output, and I think output expansions are self-reinforcing when there is high unemployment and unused capacity. Greg, Here’s the thing. You can think of the entire international economy (i.e., the countries on the gold standard sharing an international price level determined by the value of gold) as being a closed economy with a price level that is too low for full employment. Individual countries on the gold standard can achieve a recovery by going off the gold standard, allowing their currencies to depreciate, or by devaluing their currencies in terms of gold while remaining on a gold standard. You (like many others) invidiously call such a policy “competitive devaluation,” entirely missing the point. The benefit to the devaluing country is only secondarily a terms of trade effect. The primary benefit is a price-level effect. Because the primary benefit is much greater than the secondary effect, even countries that don’t devalue gain some net benefit (or at worst only suffer a marginal loss) from the devaluation of another country, because the resulting increase in income in the devaluing country increases that countries demand for the exported products of other countries. There is indeed a free lunch because the policy moves the entire world towards an expansion of output and increased employment. Stay tuned for another post with another economics lesson from RGH. First, what is the mechanism / theory which causally accounts for how different price levels produce different levels of unemployment. second, how or why could this be independent of all nations “not on the gold standard”. And third, if no country was really letting gold determine the domestic monetary supply or price level, how can we say that these countries were “sharing” an international price level. Those are the things I don’t see clearly. I am interpreting you to be asking “how a falling price level causes an increase in unemployment.” A falling price level doesn’t always cause unemployment. If prices are falling because of increasing productivity and wages are not falling, employment will remain stable. But if falling prices are also leading to falling wages, workers are likely to accept layoffs or quit their jobs in search of better paying jobs. Since wages are falling generally, they are unlikely to be able to find new employment, and the decline in employment can become cumulative. I am unable to give any interpretation to your second question. Your question betrays a basic misunderstanding. Under the gold standard, no country can control its domestic money supply because whatever quantity of money the domestic monetary authority provides, the amount of money that is actually held will be the amount that the public wishes to hold. If the monetary authority provides less than is demanded, the public will sell assets, increase exports or reduce imports in order to increase the holdings of cash. Those actions will cause gold to flow into the country increasing the gold reserves held by the central bank but before being deposited in the central bank, the public will exchange the gold for cash. The opposite happens if the monetary authority provides too much money, assets will be bought, exports will go down and imports will rise, causing an outflow of gold. None of this has any effect on prices (as a first approximation), prices being determined by commodity and gold arbitrage that prevents prices in any country on the gold standard from deviating from the gold equivalent price.